What a fabulous bike ride! 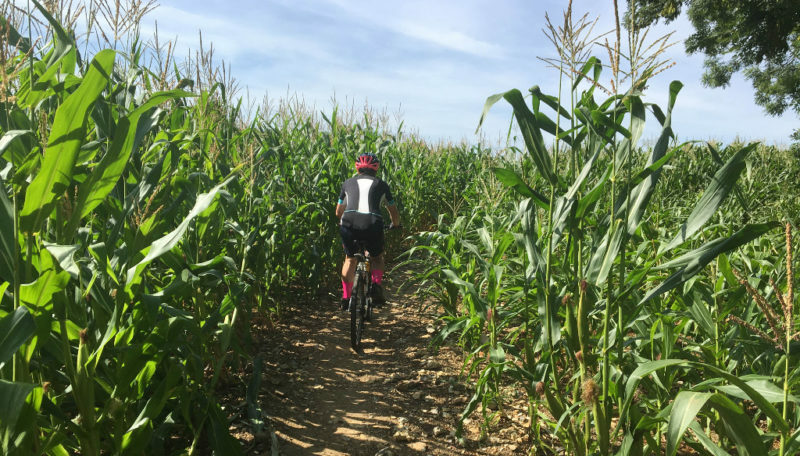 Beautiful clear sky’s, scenic off road trails, across parched fields and through six foot high sweetcorn. Plus some bizarre cafe rules – more on that later. Five of us set out Karen, Ricky, Roger, Gorm and Pete. The weather was going to be a scorcher so we made an early start and headed into the shade of tress. Up through the woods to the Fox at Old Coulsdon then down to the bottom of Farthing Down and up along the bridle path and trails up to Chaldon. 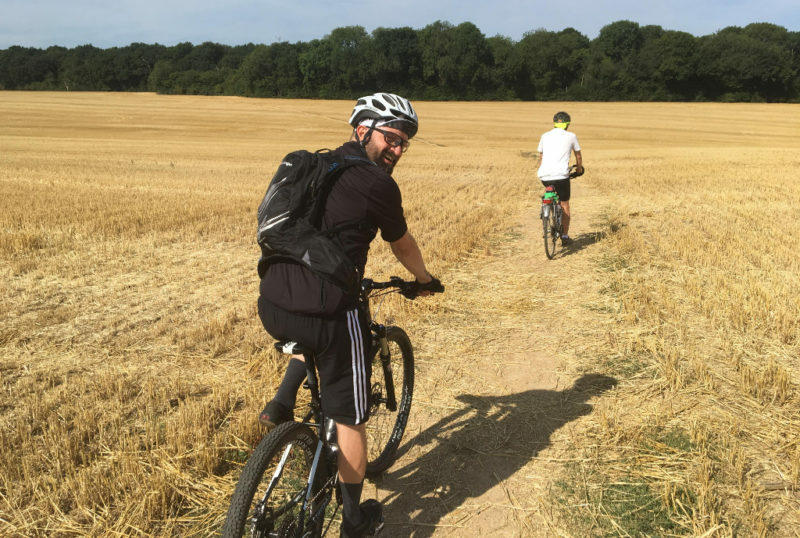 We then cut across the fields by Chaldon Church along a footpath surrounded by Sweetcorn and up to the North Downs where we enjoyed a long descent down and underneath the motorway near Merstham. 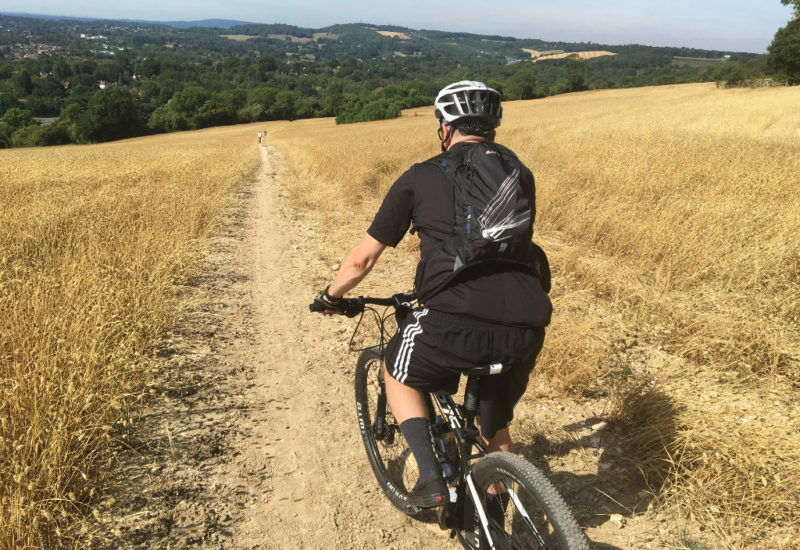 Then it was on to Bletchingly, along Rabies Heath Road and then left down another fabulous bridle path down to Godstone. It was at this point that a quick stop by Roger led Karen to have an unscheduled dismount which required a couple of minutes pause to regain composure. Fortunately no lasting damage and all was well. The Green Rooms at Godstone has been a popular stop for us and we were looking forward to poached eggs, pumpkin cake, tea and some iced water in the sun. There were four seats at a table and five of us, but apparently they have outside chairs and inside chairs and it was simply not possible for an inside chair to come outside even for a moment on a dry and sunny day . So it was either leave Ricky standing or move on. They did partially redeem themselves by patching up Karen’s grazed knee which was kind, but their intransigence on the inside / outside chair rule lost them our business. Maybe it’s a Godstone local byelaw. Fortunately Flower Farm was just half a mile away and they had a very nice outdoor space with plenty of seating. However poached eggs were off the menu as they stopped serving Breakfast at 11.30. They had lots of choice for lunch, but lunch wasn’t served until 12.00 so basically no hot food was available even though there were plenty of people behind the counter and in the kitchens. Ricky managed to get his five a day with some interesting looking green sludge, he didn’t say what it tasted like. Gorm found a nice chocolate cake which he tempted Karen with. The rest of us just settle with a cup of tea. 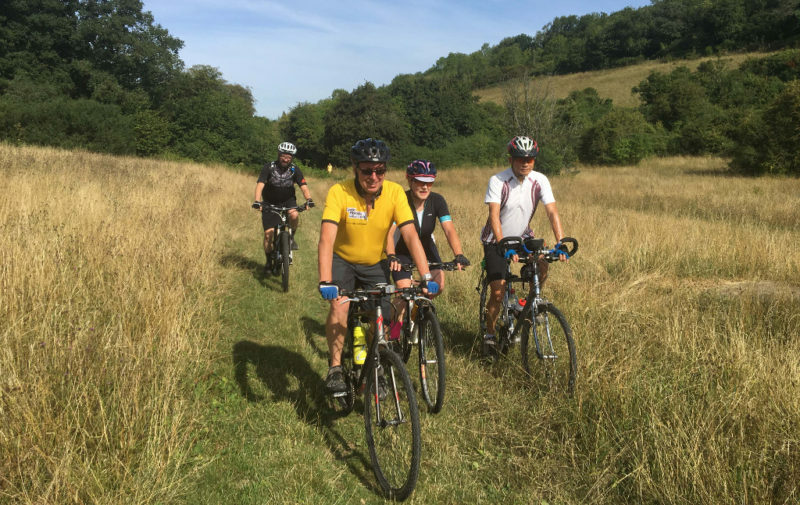 The return trip was up Flower lane then turning left on the North Downs Way and uphill through woods to the Harrow on The Hill. 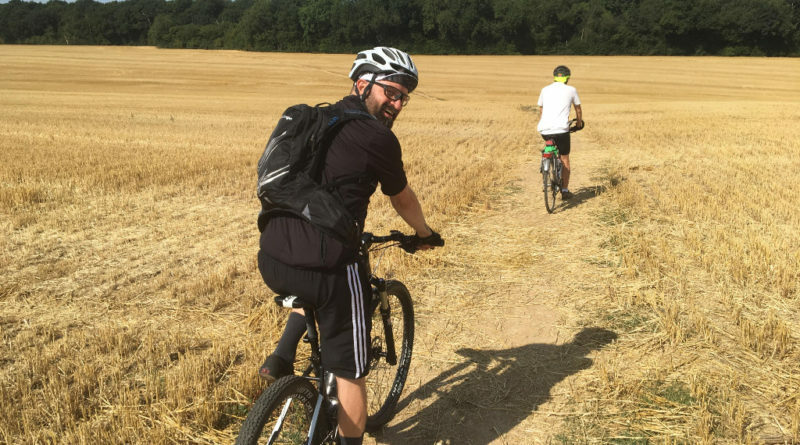 We saw a number of runners doing The Centurion Run, 100 miles, from Farnborough to Ashford which must have been particularly gruelling in the 30 degrees plus temperature. A quick cooling drink was enjoyed in the beer garden at The Harrow, before we headed for a second beer stop at the Wattenden Arms (well it had been hot). 30 miles at 10.00mph. Elevation gain 2,356 ft.